Our plan for Sunday – which actually worked out, astonishingly enough – was to go get our Christmas tree at a local farm, set it up, and braise something for dinner so it could be cooking away and scenting the house while we decorated our tree. Often, of course, these plans don’t work out, because getting the tree into the house takes approximately five times longer than you think it will, and by the time it’s upright, the floor is vacuumed and the furniture has all been rearranged twice, you don’t have time for an involved dinner. But we actually allowed enough time for once, so we had our braise and our tree, too. I was very pleased with the braised short ribs I made out of Molly Stevens’ book All About Braising, and wanted to try another recipe or two from her. 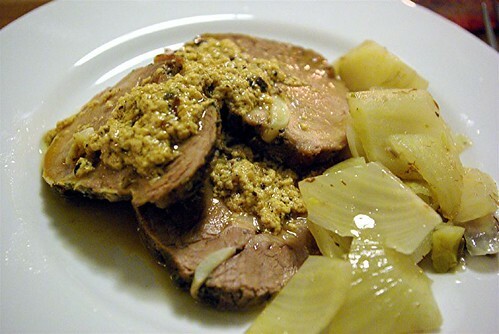 We have an Italian friend who used to make pork cooked with milk and sage, but I had never tried it myself (I think I still wasn’t convinced it really worked) so when I saw a recipe for Pork Loin Braised in Milk, I thought I’d try it just as written and see what happened. First, I combined chopped fresh sage, fennel seed, salt and pepper in a bowl. 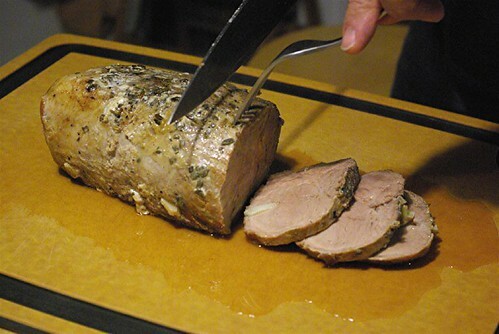 I sliced up three cloves of garlic and dredged them in the herbs, then stuffed them into slits in a pork blade roast. I rubbed the remaining herb mix over the pork. 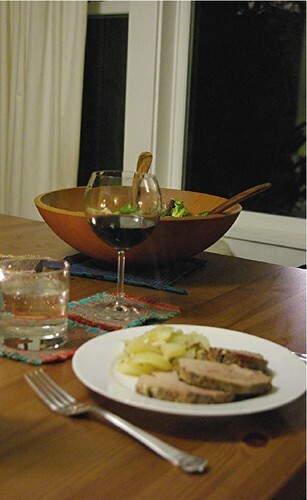 The pork was browned on all sides in a dutch oven – the pan was barely big enough for the meat. The pork was set aside briefly, and I sauteed a smashed garlic clove in the remaining fat in the pan, then added 1 1/4 cups of whole milk and brought it to a boil, scraping all the good fond off the bottom of the pan. 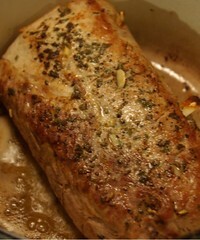 The pork went into the milk, I covered the pan and popped it into the oven at 280°. After 45 minutes I turned it, and 45 minutes after that it was done! I pulled the pork out, set it on a cutting board with foil over it, and starting boiling down the sauce. It wasn’t very promising looking, but the recipe lets you know that it’ll look like this, which I appreciated. You boil it down, stirring the whole time, until you just have milk curds in a thick golden sauce. The pork was perfectly done, and wonderfully moist. The sauce had a great rich salty flavor. Yum. The recommended side dish to go with the pork was herbed braised fennel, and as long as I was following recipes, I figured I’d try that, too. The recipe seemed very lengthy and called for the oven to be at a different temperature than for the pork, so I simplified it and did it on the stovetop. I chopped a few cloves of garlic and tossed them in a skillet with olive oil, about five anchovy fillets, some fennel seed and a few springs of fresh thyme, added chopped fennel and sauteed it all together for a bit, then added vermouth and chicken stock and covered the pan. The end result was tender and delicately flavored, but actually not very fennel-ish any more. 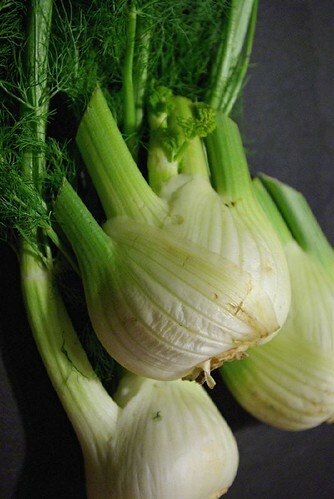 We’ve decided we prefer fennel roasted. The final plate was pretty unattractive, but much much tastier than it looked. We added a salad of sharp greens and finished off a bottle of wine left over from the day before, a Las Rocas garnacha. The combination of flavors was swoonworthy. It sounds “Swoonworthy!” I like your recipes a lot. Very different and interesting. Keep up the good work!